Following Sunday’s fight, Denver Broncos cornerback Aqib Talib and Oakland Raiders wideout Michael Crabtree were suspended by the NFL. Both were suspended for two games, according to the NFL Network. The two got into a scuffle during Sunday’s game, with both throwing punches. They were suspended for unsportsmanlike conduct and unnecessary roughness, USA Today reported. Both Talib and Crabtree are appealing their suspensions. 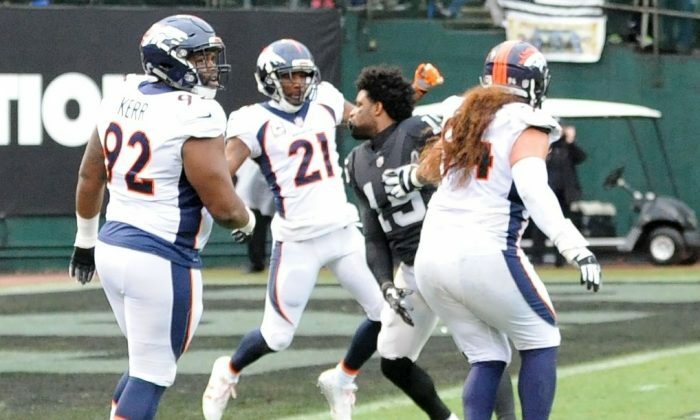 In the fracas, Crabtree blocked and pushed Talib out of bounds, prompting Talib to rip Crabtree’s helmet off. Several Denver players then rushed over. They both shoved one another before facing off again and throwing punches. Talib reportedly ripped off Crabtree’s chain from around his neck—doing the same thing he did during a game last year. According to USA Today, Crabtree had taped the chain to his chest this time. They were both ejected from the game after that. Broncos cornerback Chris Harris alleged that Crabtree punched him during the previous play. NFL vice president of football operations Jon Runyan noted the punch in a letter to Crabtree, USA Today reported. “First, you punched a Broncos opponent Chris Harris in the midsection, resulting in him being removed from the game. Then, on the subsequent play, you blocked a different Broncos opponent (Aqib Talib) into the sidelines beyond the yellow media border, well after the play was over,” he said. He also wrote a letter to Talib. “First, while competing on the field of play, you deliberately ripped your opponent’s chain from his neck just as you did last year when you played against him. Then, when the two of you went to the ground after a subsequent play, you aggressively removed his helmet and threw it in his direction, endangering him and various sideline personnel in the near vicinity. Finally, once you were momentarily separated from your opponent, you again engaged him and threw a punch,” he wrote. We work hard to deliver the most important and interesting news every day for you, but would like to ask a little favor in return: Would you please share this story with your friends? You can just click the share button below. Thank you!